Yes, I realize that it is already May 2016, but I promised that I would post updates on our trip and so I shall. October started out with us leaving Pahrump, NV on October 2nd and heading off to Las Vegas (just about an hour down the road). We pulled up by the Allure Wedding Chapel and proceeded to GET MARRIED! Only 90 minutes later we had finished the ceremony and a raft of pictures and were back in the bus. Dress and suit packed away, we were in shorts and on the road by noon, heading toward the Grand Canyon. We drove about 175 miles and made our first stop at – believe it or not – an empty lot off a freeway exit outside of Kingman, AZ. Not the most romantic site for a first night, but hey – we’ve been together for 18 years already! Next morning we were off bright and early to tackle the next 140 miles. 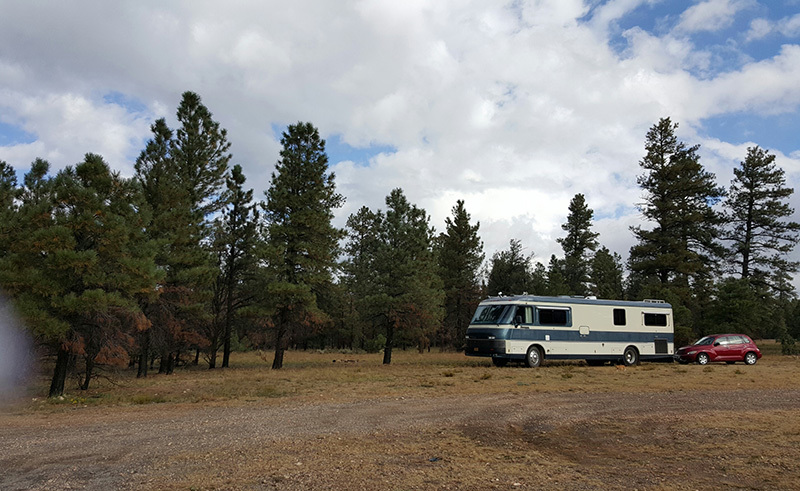 We found a beautiful spot off State Road 688 in the Kalibab National Forest, just south of Tusayan, AZ (which is just south of the entrance to the Grand Canyon National Park). It was totally secluded, and our first long(ish) term boondocking experience. We stayed 6 nights, completely self-contained. There was good cell reception and with the generator we were able to operate both our computers with ease. It was a great place to honeymoon! 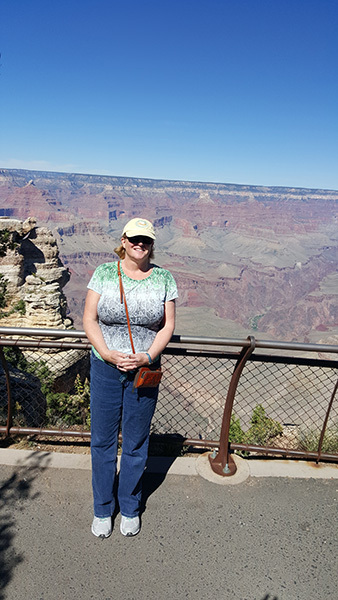 On leaving Kaibab National Forest, we went to the Grand Canyon National Park and saw the sights. Absolutely spectacular and a shouldnt-be-missed experience. Leaving the park in the early afternoon, our next destination was the North Rim of the Grand Canyon. 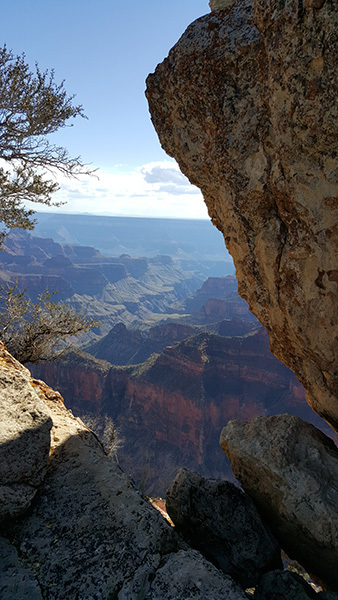 Only 9 miles as the crow flies, it is actually about a 250 mile drive – you have to go all the way up the river canyon to where you can cross … and then back to the North Rim. The terrain is rocky and beautiful with huge cliffs interspersing desert. It took two days; we spent one night in the back lot of a gas station / truck stop just south of Cameron, AZ. The North Rim is different than the South Rim. Not as many tourists and with more trees and different terrain. It must have been built earlier, because there are some edges you can look over that are WAY steeper than any safety precautions would allow if it were being built today! I did manage to walk out to the very tip of Bright Angel Point. We couldn’t take the dog (a good thing), so we took turns walking out. So on my own, I made it out there … I can say with absolute certainty that I really don’t like heights much! But, okay, it was really spectacularly, stupendously, amazingly beautiful. 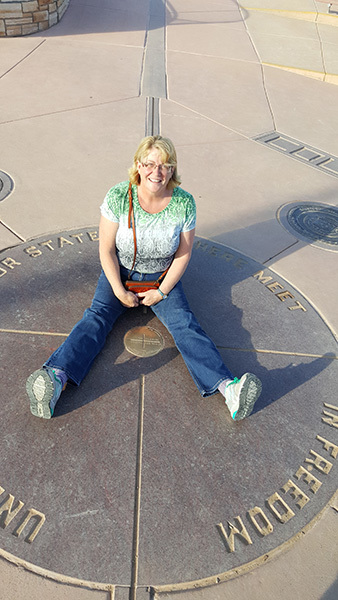 At that point, it was time to head back to civilization, so we set our sights on St. George, Utah, about 100 miles away. Getting there, we hit the 2,ooo mile mark on our trip. In St. George we did the in-town things (Best Buy to pick up Jere’s repaired tablet we’d had shipped to that store, Costco, WalMart, PetsMart, etc). We even went to a movie and I got my nails done! The night was spent in a corner of the Costco parking lot, and we were up early to head toward Zion National Park. What can I say about Zion? It is almost a religious experience. I’ve never seen anything so amazing as the ravines following the river. We had to unhook the car, park the bus and then drive in and park. We took the tram up and down the canyon… amazing. Can’t believe I didn’t take any pictures! Getting OUT of Zion … that was a different experience altogether! The road is so steep and narrow that we couldn’t keep the car hitched, so I drove the car (with the dog) and Jere drove the bus. Scary, even in the car! We had to pay an extra $15 for passage through the tunnell (anyone who’d been there knows why that is italic and bold) because it’s so short and narrow that RV’s have to drive down the middle of the road, blocking all the oncoming traffic. It’s basically a one-way tunnel governed by lights on each end. 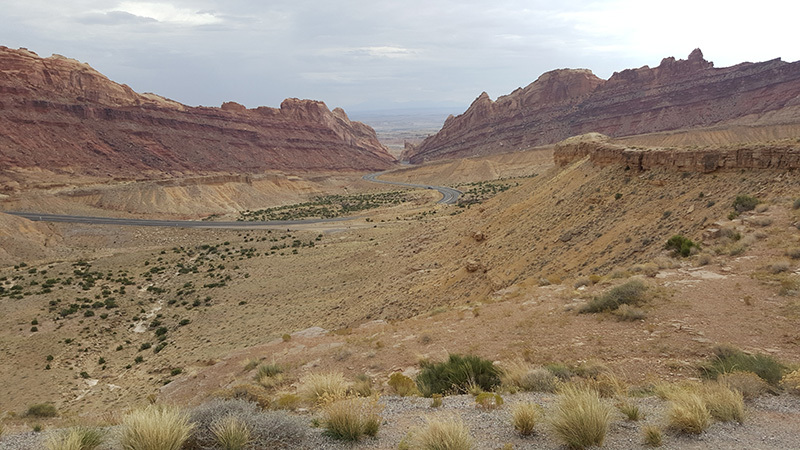 From there we headed generally north, boondocking in the Paiute State Park in Junction, Utah, and in the Fishlake National Forest outside of Joseph, UT. 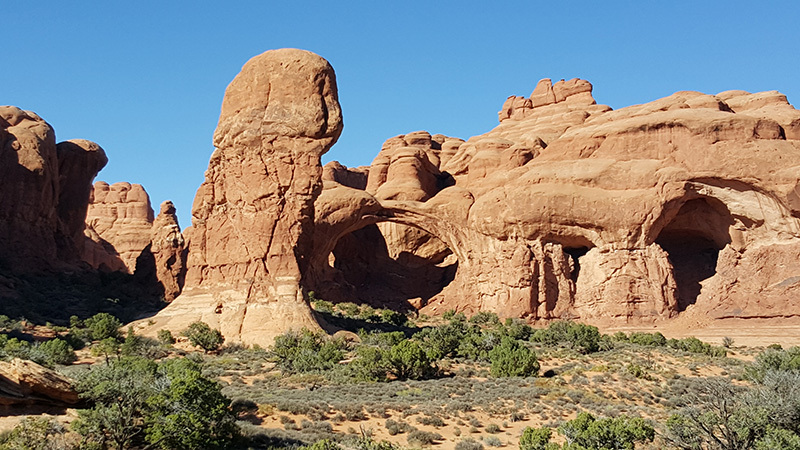 We did drive through this amazing rock formation – reefs, they are called – and ended the day at the the AOK (used to be KOA) RV Park in Green River, Utah, where we stayed for a week. 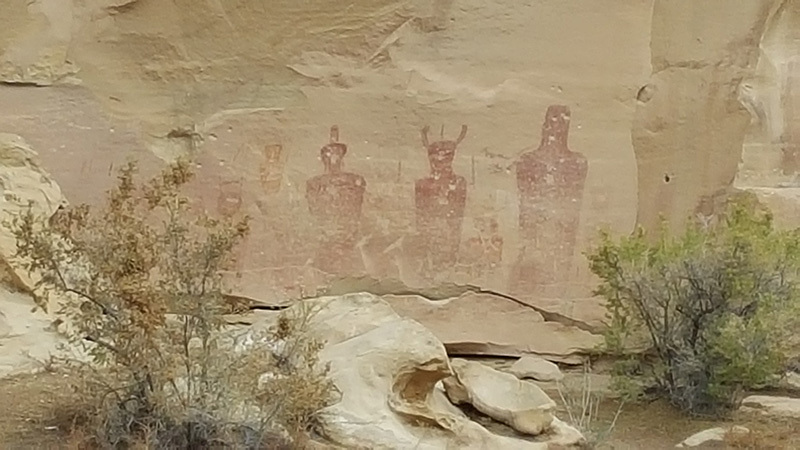 While we were there, we did take one nice day trip to Sego Canyon (just east of Green River) and looked at the petroglyphs carved into the stone hillsides. I’m not much into the whole UFO conspiracy theory, but don’t those look like aliens? Leaving Arches National Park, we headed south and then east (and then south), hitting a couple of rest stops for over-night stays, and going through Four Corners, where I got to sit in four states at the same time (Colorado, Utah, Arizona and New Mexico). We went briefly through Albuquerque (shopping again), filled up on diesel, propane, water and groceries, and dumped our tanks. We hit 3,000 miles on our trip just as we got to our final stop for the month – a lovely little piece of desert on BLM land on Monticello Point Road, just north of Truth or Consequences, NM. 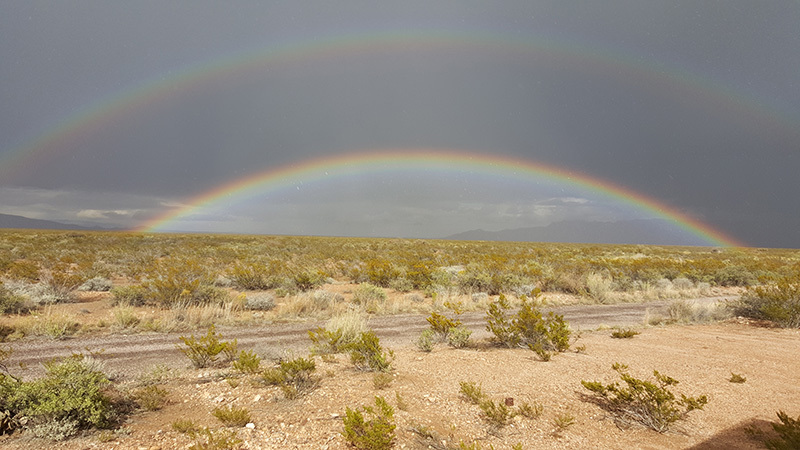 While staying there I saw my first horizon-to-horizon double rainbow. And that’s where we were at the end of October, 2015. If you (like me) prefer to see these travels on a map, see Our Travel Adventure page. The Google map there gets updated as we progress on our travels. Congratulations on the wedding nuptials. Your dress is stunning!!! 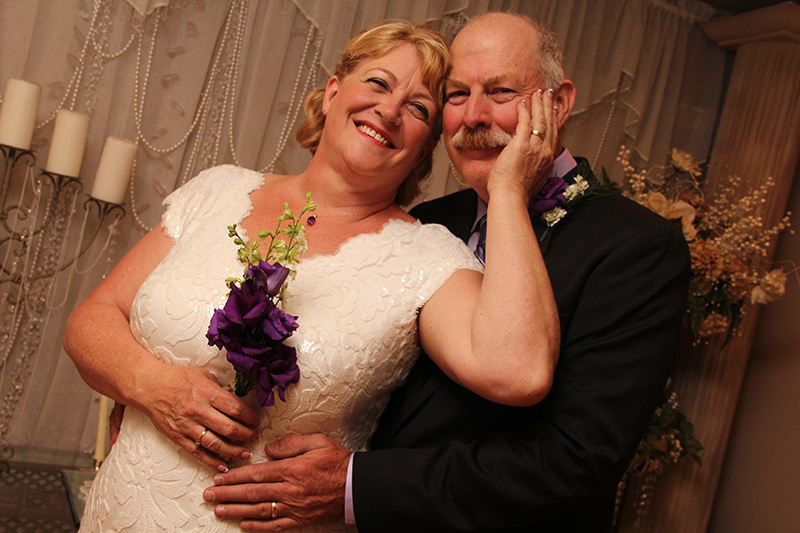 Just poking around on the Internet this morning at thought, “What are Marie & Jere up to? So, I found out some. Really good sounding travels! Happy wedding! (’bout time huh Jere?!). Happy trails! Glad you found us, Cuz! Thanks for the happy wedding (I shared with Jere). We’re definitely enjoying the trek. Plan to swoop through CA sometime (maybe this winter or late spring) and will definitely plan on stopping by your neck of the woods.